In my opinion, people get their cats declawed for reasons selfish to the owner of the cat as opposed to thinking about how it will affect the cat. Declawed cats might not be able to scratch furniture, but you can cause a lot of other problems by declawing your cats. It’s much better to let your cats keep their claws and give them ways to use them appropriately. Why is declawing cats bad? Like mentioned at onegreenplanet.org, your cats might become more territorially aggressive or run into problems with infections if they are declawed. Also, even though it’s not a situation a person might like thinking about, but if your cat did escape or get lost from your home it would be at a severe disadvantage out in the world without it’s claws. What should you do instead of declawing? 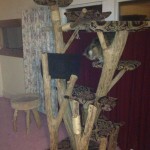 Cat trees are a great idea as most have multiple scratching posts and will encourage your cats to use their own furniture for lounging and scratching instead of your own. Pheromone sprays can be used to deter cats from scratching on certain things or certain areas. Just give your cats an environment that has places for them to scratch, and keep their claws trimmed, basically. That’s my tip.